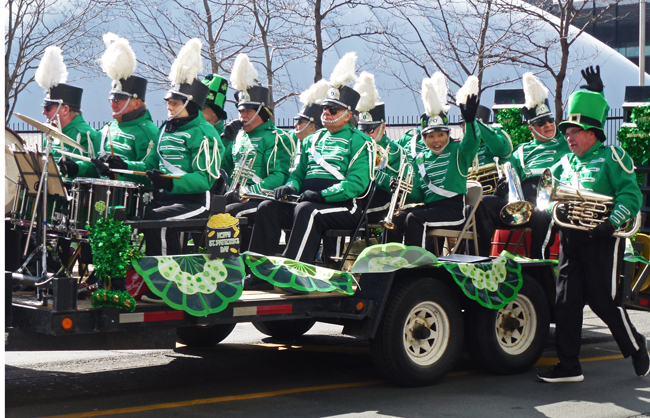 I was right near the beginning of the St Patrick's Day parade and this band had not yet begun to play and they were all looking a bit cold except for one of them. The woman just right of centre must have spotted a friend or family member and what a smile and greeting they got! She really got into the spirit of the day! That is a FABULOUS capture, Pat! All part of the fun of the parade! Hello, great capture, the lady look happy. Happy Friday, enjoy your weekend! They do look all bundled up and still feeling the cold. I'm not sure how they get their fingers to work when it's so cold. I'll never understand the motives that drive some people to do what they do, but then again, I'm glad they do what they do, like get up and go march in the dead of winter or spring or whatever and try to toot their horns while practicing on a trailer! What a fun shot and I'm sure that tooter is yelling something like "Hail, St. Patrick," to you! Stay warm, my friend! She also looks like the youngest one of the bunch. I you were the last member of the band to arrive, you did not a seat and had to walk the parade route. Fun shot. Great photo, Pat. She is very happy to see someone she knows and give a big wave to. One woman in a group of men, cool ! Beautiful and I bet they sounded great. The guy walking on the side is getting a workout while they ride!